Layang Layang is the ideal dive destination with warm crystal clear waters rich in both pelagic and macro diving. The ring of reefs form a calm lagoon within the centre of the atoll but outside adventure looms. The coral walls plunge down to the sea floor 2000 metres below as barracuda, hawksbill turtles, manta rays, and tuna swim in the nearby open ocean. Rich in marine life the most sought after creature here is the hammerhead sharks which are found in abundance during the April-May mating season. Layang Layang means “Place of Swallows” in the Dusun language – referring to the migratory birds that inhabit the island. A bird sanctuary, the island is home to not only swallows but also brown foot boobies, egrets, and crested terns. Finding refuge within the lagoon the birds use this predator free area as a migratory stop and as a breeding ground. As a world renowned dive destination Layang Layang is perhaps the best known atoll among the Borneo Banks – a group of atolls amid the Spratly Islands. Called the “Jewel of the Borneo Banks” Layang Layang is also home to several man made structures. These include a large windmill, the only one of its kind in Malaysia, which helps provide extra electricity to the naval base on the island. The Malaysia Navy has held a base on the island since 1983 and the Royal Malaysian Navy help maintain security within the area. The navy base does not diminish the beauty of the island and great efforts are made to protect the health of Layang Layang’s marine creatures. The Malaysian Fisheries Department also has a base on the island to conduct important research on Layang Layang’s biodiversity. Named after the dog-tooth tuna often found cruising off the reef here, this site offers the best in pelagic and colourful reef fish. A gently sloping sand bank that quickly plunges to the seabed 2000 meters below, this site offers a wall covered in yellow gorgonians surrounded by angelfish, batfish, and colourful parrotfish. Barracuda can be found out in the blue. Keep your eyes open and you may see the elusive sunfish. Hit this site at the right time of the year and you’ll see schools of hammerhead sharks cruising past. Grey reef sharks also call this site home as do many reef fish. The wall at this site is very steep and for the will actually overhang above you for the majority of the dive. Swim down 40 meters to find a shelf covered in huge barrel sponges as well as coral fans in shades of red, blue, and purple. Rare black coral bushes can be found in a small triangular cove at 25 meters down, surrounded by trevallies and groupers. Nearby are orange gorgonians hiding pygmy seahorses and giant frogfish. This large dive site has so much to see it may take several dives to cover it all. One the island’s more famous dive sites this one is known for its hammerhead sharks, grey reef sharks, manta rays, and eagle rays. A shallow cave about 30 meters down is home to several white tip reef sharks with giant trevally and dog-tooth tuna guarding the entrance way. Beautiful purple fans and sponges cover the ledges of this dive with triggerfish, squirrelfish, and parrotfish swimming overhead. South of the island this dive site turns the diver’s attention away from pelagics and back to the reef. Table corals, staghorn, plate, mushroom, and brain corals cover this dive with their beautiful colors. The coral colonies form vertical stacks that divers can search for morays, lobsters, and small shrimps or crabs. Mantis shrimp, sea urchins, parrotfish, and pufferfish also call this site home. A flat dive site with a gentle slope The Valley may not have interesting geography but it is home to a rich array of marine life. Turtles nestle along the slope surrounded by schools of groupers, sweetlips, and snapper. Nudibranchs and small crustaceans can be found nestled among the coral overhangs and on the edge of the reef you may see a few hammerheads. Look out for triggerfish nests as you swim through as these fish are quite territorial. Of the wreck that was once here all that remains are a few scraps of metal. Instead, this site is covered in a beautiful coral garden of soft and hard corals. Squirrelfish, goatfish, and hogfish are prominent. You may also see barracuda, trevallies, and white tip reef sharks. 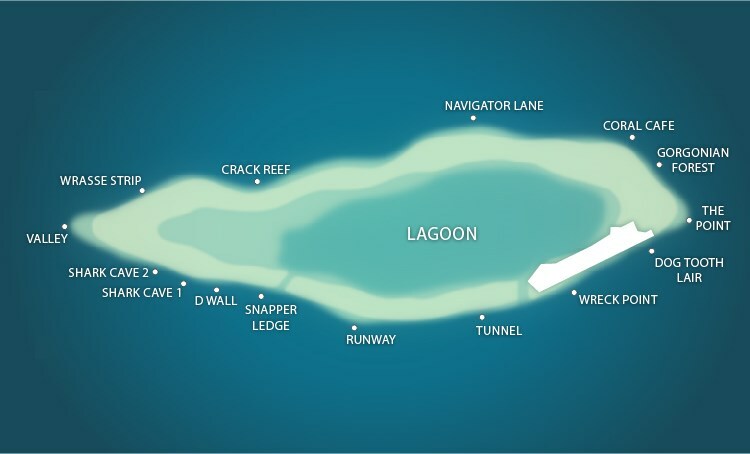 Although most divers tend to stay on the outer reefs this atoll’s inner lagoon should not be forgotten. With a depth of 20 meters the lagoon is an excellent place for divers and snorkellers alike to look for macro creatures such as seahorses, cuttlefish, and pipefish. The dive season in Layang Layang lasts from March through August and closes for the monsoon season during the rest of the year. The only resort on the island is open throughout the dry season. Keep in mind though that the hammerhead mating season is in April and May.